You'll suddenly find yourselves in a very different world after your flight from Quito to the Galapagos Islands. As you board your vessel, the M.Y Grand Queen Beatriz and follow in the footsteps of Charles Darwin, start to encounter nature at its finest. 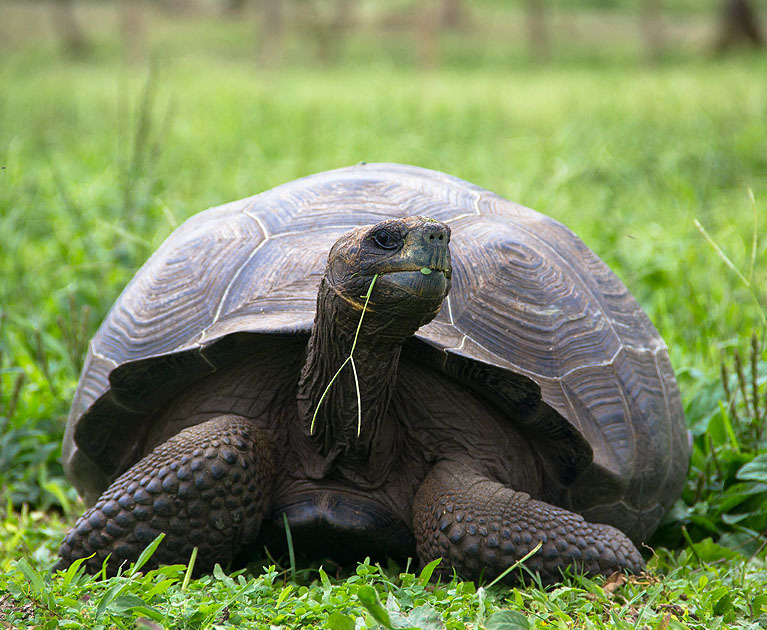 This is indeed the Galapagos journey with something for everyone. 20 Aug; 1 and 29 Oct; 26 Nov 2019 departures, subject to availability. On arrival at Quito’s Mariscal Sucre International Airport you will be met and transferred to your hotel. The remainder of the day will be at your leisure. Quito sits at high altitude under the towering Pichincha volcano. It is a beautiful city, arguably one of the most beautiful in South America. The city stretches along the valley and is surrounded by the Andes. The Old Town of Quito is awash with history, with more than 30 churches to explore, and a number of fascinating museums. La Compania de Jesus is considered to be the most beautiful and ornate churches in the Americas. The city’s oldest street, Calle La Ronda, is well worth exploring. On arrival in the Galapagos, you will be met in the arrival hall of the airport (look out for ‘Grand Queen Beatriz’ signs) by a transfer guide and transferred to our motor yacht – ‘M/Y Grand Queen Beatriz’, anchored on the other side of Santa Cruz Island. 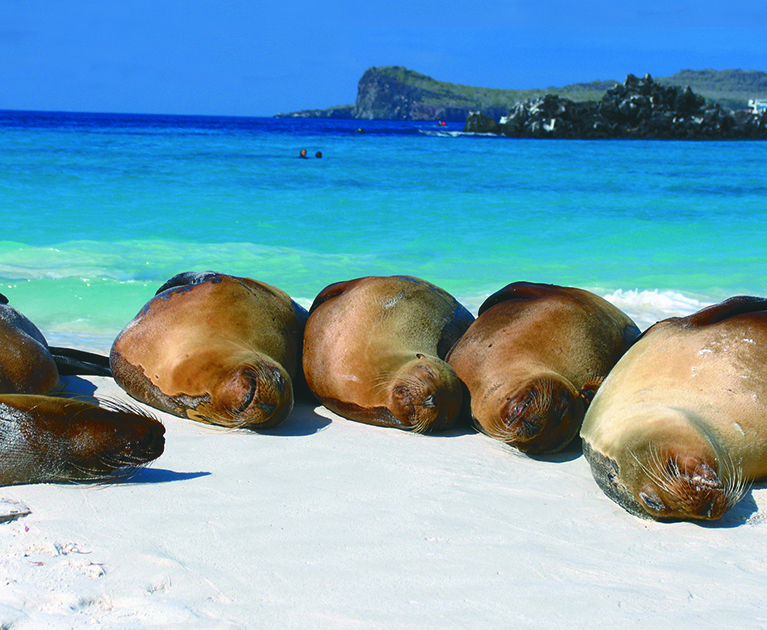 Santa Fe Island is home to many sea lions and these ones are very eager for swimming partners! It’s a lovely place to take a dip, offers a dense concentration of wildlife, and is a fantastic place to see many of the stars of the Galapagos in one relatively small area. Expect to see Galapagos hawks, land iguanas, a variety of finches, Galapagos mockingbirds, sea lions, marine turtles, frigatebirds, Galapagos doves and lava lizards. It’s a naturally beautiful island as well with one of the most attractive coves in the archipelago and the jade-green waters are ideal for snorkelling. A trail follows the coast into the opuntia forest, where you see Santa Fe’s trees – the largest in the Galapagos. The island is also home to a unique sub-species of land iguanas. Hiking towards the cliffs on Santa Fe will lead you to a forest of prickly pear cactus. A member of the cactus family, their name comes from the pear-shaped fruit the plant produces. Santa Fe is home to endemic land iguanas. A small island, Plaza Sur is nonetheless a place of great beauty, where you will get close to sea lions and on to trails past one of the Galapagos’ largest land iguana populations, resting amid cacti and volcanic landscapes coloured bright red and green by sesuvium. The island’s rugged southern cliffs are an excellent place to spot tropicbirds and swallow-tailed gulls, as well as the ‘Gentlemen’s Club’, a gathering of male sea lions either too young or too old to be beachmasters! After an overnight night sail you will wake up on the island of Española – the southernmost island of the Galapagos and one of the most spectacular. Because of its remote location, this island has a large population of endemic fauna. It is the breeding site for nearly all of the world’s 12,000 pairs of waved albatrosses and also home to colonies of blue-footed and masked boobies. You will also pay a visit to Punta Suarez, one of the most attractive locations in the Galapagos and home to large and varied wildlife population – a walk along its trails will take you to a cliff top viewpoint, where you’ll gain a magical panorama. Boobies line the rocky shoreline beneath you, while frigate birds may be seen overhead; nearby enormous male sea lions can be seen lounging and albatross use the cliffs as their ‘runway’, helping become airborne by the southeast winds that blow across this part of the island. On a ‘panga’ ride you can observe the three varieties of boobies nesting in the Galapagos and enjoy a snorkel from the beach.